Os naviculare is an accessory ossicle. 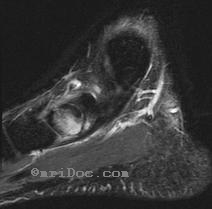 It may form a syndesmotic joint with the navicular bone, which may become inflamed. Bone marrow edema is seen along the syndesmotic joint. Navicular fracture, avascular necrosis of the navicular bone.